Main House, 3 queen size bedroom/bathroom suites and 1 bedroom with bunk bed shares a bath with 1 queen size bedroom; sleeps 8. The exquisite main home and guest cabin is in a premier location on the northeast lakeshore of Flathead Lake that is in northwestern Montana. Our home boasts magnificent views, north, south and west of Flathead Lake and views of the westerly mountains from every room. Flathead Lake is the largest freshwater lake west of the Mississippi, covers over 191 square miles and is one of the cleanest in the world. In addition to our home being set on this beautiful lake, it is also located within approximately 4 minutes from downtown Bigfork (shopping, five-star restaurants, art galleries and playhouse theater), a nearby public boat ramp, fitness center, and a multitude of golf courses. Glacier National Park, Whitefish Mountain and Blacktail Mountain hiking and ski areas are all within an easy 1.5 hr drive; and Glacier International Airport is located within 45 minutes of this home. This beautiful Montana-style main home is on two levels, is approximately 4,000 square feet, and comfortably sleeps a total of six adults in the three queen-size master bedroom and bathroom suites and sleeps two additional adults or children in a bedroom with bunk beds. From the moment you enter this home, you are met with large picture windows and stunning views of the Flathead Lake and nearby mountains ranges. The main floor boasts high ceilings with massive, “hand-scraped” Montana logs and custom wood railings throughout the main living and stairway area. The main floor is light and airy with an open floor plan of the kitchen, large dining area, living area, guest bathroom, master bedroom with natural gas fireplace, private office, master bath, private master outdoor deck, large outdoor deck off the dining area with BBQ, a double car garage and parking area. The lower level also overlooks the lake, and includes a second livingroom with a pool table, two queen-size bedrooms each with a bathroom and glass sliding door onto the patio and lawn, one bedroom with bunk beds that shares a bath with one queen-size bedroom, laundry room and sauna. •	Beautiful, over-sized soft leather and upholstered furniture in the living area where you can sit to enjoy the views, watch evening sunsets, watch a large variety of migrating birds, visit with friends, or curl up to read a novel. •	Floor-to-ceiling natural stone gas fireplaces both in the living room and in the main level master bedroom suite, each with floor-to-ceiling natural stone and wood mantles create warm, cozy rooms. •	Three queen-size master bedroom suites each with queen size beds and direct access to outdoor patios for morning coffee or meditation. •	Tiled-floor bathrooms adjacent to each of the three bedroom suites, large, jetted tub and separate shower in the main level master bath and tub/shower combinations in the other two master bathrooms. •	Granite countertops in the kitchen, with built-ins, high-grade alder wood cabinets side-by-side refrigerator/freezer doors, 6 burner gas stove, dishwasher, and double sink. The kitchen is fully stocked with small appliances, dishes, cookware, utensils, silverware; everything except the food. •	Large dining area that seats 10 - 14 for a dinner with family and friends. •	Laundry room with sink, washer, dryer, cabinets on the lower level. The cozy Montana-style guest house is on two levels, is approximately 600 square feet, and sleeps two on the main level queen-size bedroom and sleeps two additional adults or children in a queen bed located on the second level loft. The guest house also has large picture windows and stunning views of Flathead Lake. The main floor includes an open, living, dining and kitchen area with gas-heat stove, along with master bedroom, washer/dryer, separate bathroom, wooded deck outside the sliding glass doors, BBQ, driveway up to the guest house and lower level parking area. •	Beautiful, over-sized soft leather and upholstered furniture in the living area where you can sit to enjoy the views, watch evening sunsets, watch a large variety of migrating birds, visit with friends, or curl up to watch tv or read a novel. •	Wood floors with area carpets in the living area, carpet in the loft. •	Queen-size beds both in the main level bedroom and in the second level loft; patio access from the main level bedroom into the lawn and beautiful wooded setting. •	Granite countertop in the kitchen, with microwave and counter-top oven, apartment size refrigerator and sink. The kitchen is stocked with some small appliances, dishes, cookware, utensils, silverware; everything except the food. •	Cozy dining area that seats 4 for a dinner with family and friends. •	Television in the main level living area, with dvd player and cd player. The boat dock which is accessible for both the main house and the guest house has space to dock two boats and two jetskiis. There is also a private beach area adjacent to the dock. Our Flathead Lakehouse and guest house are located approximately 4 minutes south of downtown Bigfork, accessed via Highway 35, 25 minutes from Kalispell, 45 minutes to Glacier International Airport, 30 minutes South to Polson for great golf and shopping and 55 minutes to Glacier National Park. Golf, fishing, horseback riding, water sports, shopping, and sightseeing are all nearby. Sun bathe and swim in the lake, or read and relax in the shade by the waterside, all the comforts of home await you in this beautiful home. Our parents built this home because of the peaceful beauty that emanates from the lake and throughout the country side. We lived in NY and this was the perfect escape and family getaway. We put away the remote controls, dusted off our hiking boots and spent entire days outdoors appreciating nature and spending time with family. Our mother was an award winning architectural designer and this home was featured in log home magazines in 1994. Our family spent 3 months out of the year living in this home, and once our parents retired, more or less, they spent half the year here. My brother and I now have this treasure and we are excited to share it with you and hear your stories. We chose this location because of its lakefront land, amazing sunsets, and proximity to ski mountains and Glacier National Park. We also fell in love with the small mountain charm of Bigfork town with its famous artists and delicious restaurants. 3.5 bathrooms in main house; 1 bathroom in guest house. Local calls only. Long Distance calls at your expense. Cell service is available in this area. Gas fireplace in the main living room as well as the upstairs master bedroom. wireless internet in the main house; intermittent access from guest house. Main house has a full kitchen and small appliances; Guest house has apartment size refrigerator, toaster oven, microwave and BBQ only, with kitchen dishes and utensils. Board games downstairs under the TV. some young children's toys are scattered around the house in closets. Easy to rent in town at the Marina Kaye, and keep at the boat at the house. This exquisite Montana-style log home has a beautiful rolling lawn to its own private beach area and has its own boat dock where one boat and 2 wave runners can be docked. Guest home renters have full access to the waterfront. 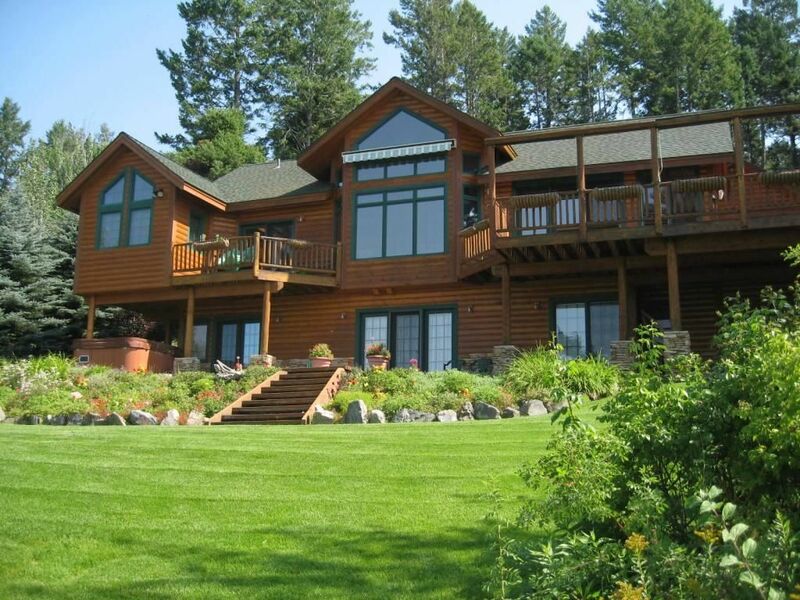 Beautiful home and property on Flathead lake. We have rented many homes on the lake and this one is by far the best. Well designed property on a spectacular lake, quite possibly the best family friendly lake ever. Lots of beds, lots of bathrooms, as advertised. Good access to the dock and small beach with room to tie up the three boats we had. Clear, clear water at a perfect swimming temperature. The house was very livable with some minor irritations (gas stove burners sometimes needed to be lit with a match, old and dirty tea towels and pot holders, some basic utensils missing). Maintenance company immediately responsive when we called with concerns. There is a hot tub on the property but for some reason we were not allowed it’s use. Some paint is needed outside but that did not detract from our enjoyment. The journey from the main house to the guest house and also down to the dock could be described as vertical so be prepared. Also be prepared to launch your boat at nearby Woods Bay before bringing the empty trailer back to the house. In order to manoeuvre on the property, we had to unhook and move the trailers by hand before we could turn the vehicles around. Good grocery store in nearby Bigfork along with a few restaurants and tourist shops. Worth a visit. Our kids said it was the best experience of their lives! This place is absolutely stunning. Our whole family had one of the most memorable summers ever with great friends! We paddle boarded and kayaked and in the evening made smores on the beach. The house and cabin are both super nice, clean and comfortable. At night if you leave a window open you can hear the waves on the lake rolling into the beach just at the bottom of the yard. The views are spectacular and the water is very clear. We can't wait to go back! Montana is so beautiful! Loved the location and the house. Perfect for a large family! Beautiful home. The lake was amazing and Big Fork was a lot of fun Definitely go to a play at the Playhouse. Had a perfect week! This property is amazing. Starting with the location: right on Flathead Lake, with a dock connecting directly to the property. And the lake is stunningly beautiful. The house itself is thoughtfully designed-- most rooms open to either the backyard or a balconly, the décor is rustic and high quality-- the house is so great that there were days that we didn't leave at all. It's especially perfect for people with kids, because there's so many different spaces that is very hard for them to get bored. We definitely plan to return!